Whether this is your first exploration of inner space or you’ve devoted your life to the inward journey, this sleeper of a book will transform your relationship with yourself and the world around you. 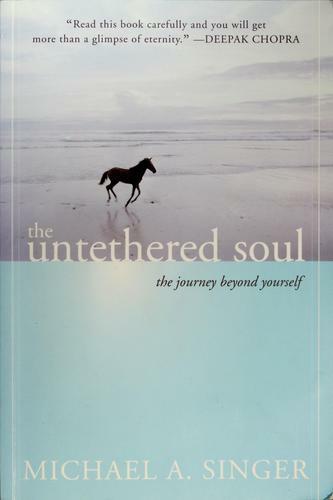 The Untethered Soul begins by walking you through your relationship with your thoughts and emotions, helping you uncover the source and fluctuations of your inner energy. It then delves into what you can do to free yourself from the habitual thoughts, emotions, and energy patterns that limit your consciousness. Finally, with lovely clarity, this book opens the door to a daily life lived in the freedom of your innermost being. Throughout, the book maintains a light and engaging tone, free from heavy dogma and prescriptive religious references. The easy exercises that figure in each chapter help readers experience the ideas that Singer presents. We are only interested in your intuitive experience of what it is like to be you. We are not looking for your knowledge; we are seeking your direct experience. You see, you can’t fail at this because your “self” is what you are, at all times and in all places. We simply need to sort it out. After all, it can get quite confusing in there. The chapters of this book are nothing but mirrors for seeing your “self” from different angles. This is the first in a series of books published under the auspices of The Institute for Noetic Sciences (www.noetic.org). Michael Singer is founder of the Temple of the Universe yoga and meditation centre in Florida. For more resources, visit untetheredsoul.com. Who are you? Noted spiritual teacher Michael Singer explores this fundamental question to help readers learn to dwell in the present moment. Singer, founder of the Temple of the Universe yoga and meditation centre in Florida, writes engagingly of the powerful experience of simply being yourself. A US News and World Report survey reported that more people than ever are looking for meaning and spiritual fulfillment, regardless of specific religious affiliation.Who are you? In this remarkable book, author and spiritual guide Michael Singer explores this fundamental question, seeking the very root of consciousness in order to help readers learn how to dwell in the present moment. Written in an engaging and uncomplicated voice, this book will open readers up to the radical and powerful experience of simply being themselves.